Is There Something Wrong with the Symbol of the Cross? Messianics often are in dubio about the symbol of the Cross. To my knowledge there is nothing wrong with symbolic crosses, provided that they be not used as in Catholicism, as an image to worship. During the long course of history, Judaism has been enriched with symbols like the Chanukah menorah and the Magen David. The typical symbol of Yeshua is the Cross, and we glory in a crucified Messiah. Messiah did not die on a Cross accidentally. Crucifixion was a Roman way of execution and when Messiah died on the cross, this death was the means of his victory over the Roman Empire — the final of the four Beasts mentioned in the Book of Daniel and the Apocalypse — and thus over all the wordly powers. There is thus nothing wrong with wearing a necklace of the cross, or making the sign of the cross at certain moments of the liturgy, e.g. when specific messianic berachoth are recited. Making the sign of the cross is in fact a beautiful confession of the core of our messianic faith. In touching our forehead we symbolize the authority of G-d the Father, in touching our navel we symbolize his only begotten Son, Yeshua the Messiah, and in touching our shoulders we symbolize the power of the Ruach HaKodesh. The acceptability of traditions like these should be determined according to the standards of the Torah. Making a crucifix with a corpse on it, with the intention of worshipping the image and offering incense to it, as occurs in the Roman Catholic Church, is clearly unacceptable by Torah standards. 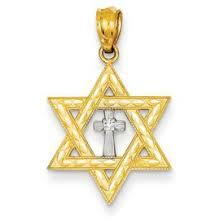 But there’s no objection to using the Cross, without corpse, in a similar manner as the Magen David, as a symbol.